My brain is melting a little bit today — because today the book that I am a contributing writer for — A book that contains a poem, a poem of mine, a poem of mine that a legitimate editor at a legitimate press thought was legitimately good enough to go into that book – well now, that book is now on pre-sale from effin’ Amazon. I mean, I know, I could sell a gallon of milk on Amazon — but oh em gee people, this is for real, and I can barely hold in my squeals of delight. 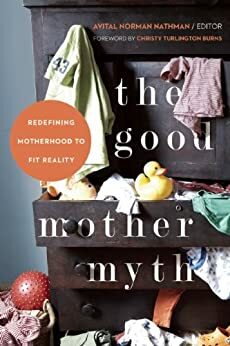 The book, The Good Mother Myth: Redefining Motherhood to Fit Reality, is a collection of essays put together by Avital Norman Nathman. Avi keeps her own blog at The Mamafesto, but also has a regular series, “The Femisphere,” for Ms. Magazine’s site, as well as a regular feminist parenting column, “Mommie Dearest,” for The Frisky. This collection of essays takes a realistic look at motherhood and provides a platform for real voices and raw stories, each adding to the narrative of motherhood we don’t tend to see in the headlines or on the news. To say I am thrilled to be part of this collection is probably more than obvious to those of you who know me, my politics, and my academic background — But you should take a look at who I’m in the company of — and then I’ll let you know that besides thrilled – I’m pretty freakin’ humbled. Psst – did you see how Christy Turlington, founder of Every Mother Counts (and ok, you know, a super model), is doing the forward – did I mention the part where I am squeeing like a little kid right now? Oh and hey, if say your politics don’t align with amazon and its selling practices (I don’t judge y’all, I’m in so in bed with the amazon devil), you can actually pre-order the book from an independent book seller. Yay indie book stores, you with your ambient music and nooks and corners –I love you too. So – yeah, I’m going to be in a book, and it’s for pre-sale on amazon — and I would be pleased as punch if you picked up a copy. Now excuse me, while I flounce around the room in my pink tutu giving out little crazy shouts of joy. What? Not your image of a radical feminist – ahwell – it’s mine- radical, mama of two, sometimes poet, sparkly t-shirt wearing, public school teaching, tutu having, twirly, humbled as hell, feminist.